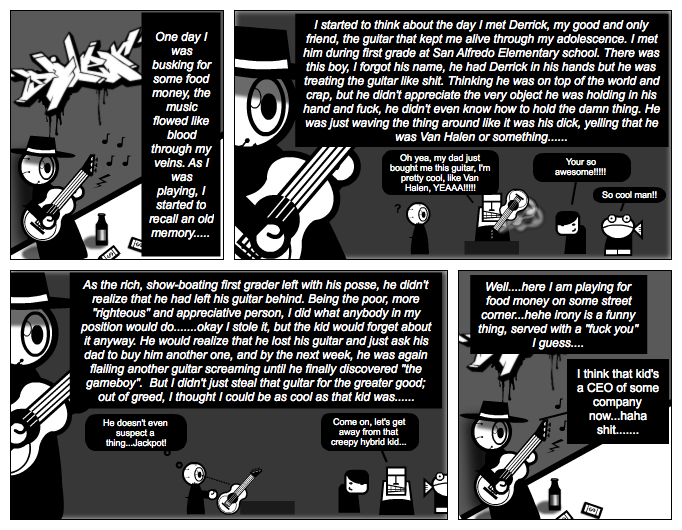 Stripgenerator.com - The Lone Wanderer: "Derrick"
The Lone Wanderer thinks about his childhood and how he met Derrick, his guitar. I hope you enjoy it....Stay tuned! Oh yea, my dad just bought me this guitar, I'm pretty cool, like Van Halen, YEAAA!!!!! He doesn't even suspect a thing...Jackpot! Ah. This is why comics exist. Superb job. Substance in story and its visually intriguing. Kepp it up, man. I love your sense of perspective here. Nice work. Faved!